The supply of land is fixed, so who owns it matters. Much has changed since the feudal days of medieval Europe, but if you want to own some acreage in the United States—the kind of swath an agribusiness corporation or mining company might also covet—your best bet is to marry into or inherit it. This reality is particularly problematic for the next generation of American farmers and, by extension, the future of our food system. The Trust estimates that “in the next 20 years, 400 Million acres of U.S. farmland will change hands.” As today’s farmers age and retire, current social and economic trends suggest these acres will fall into the hands of an ever-consolidating few and that the land itself will endure further exploitation in the name of one short-sighted economic gain or another. On the other hand, a surge in intergenerational support for a more sustainable approach to the environment, more resilient regional economies and local, organic CSAs (Community Supported Agriculture) offers hope that a fundamentally different strategy is already in progress. The problem is that while scores of young people across the country are committed to reshaping the agricultural and economic landscapes of rural America, the cost of actual land is prohibitive and the situation is only getting worse. Partnering with like-minded allies in the new economy movement, such as the Oakland-based Sustainable Economies Law Center (SELC) and the Schumacher Center for New Economics, the Agrarian Trust is working to preserve access to affordable farmland, in perpetuity, for the purposes of ecologically responsible, community-owned food production. Build the issue (what Henry George called “the Land Question”) and reframe the solution through public symposia, collaborative advocacy campaigns, and stakeholder meetings. To whom does the soil belong? A commons-based approach to land stewardship and agriculture is not a new concept. 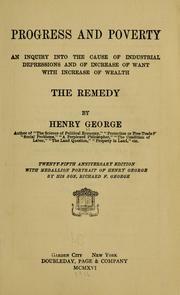 In 1881, Henry George—economist, social theorist and author of the best selling book on economics Progress and Poverty: An Inquiry into the Cause of Industrial Depressions and of Increase of Want with Increase of Wealth: The Remedy—published the The Land Question. whether, their political equality conceded (for, where this has not already been, it soon will be), the masses of mankind are to remain mere hewers of wood and drawers of water for the benefit of a fortunate few? whether, having escaped from feudalism, modern society is to pass into an industrial organization more grinding and oppressive, more heartless and hopeless, than feudalism? whether, amid the abundance their labor creates, the producers of wealth are to be content in good times with the barest of livings and in bad times to suffer and to starve? 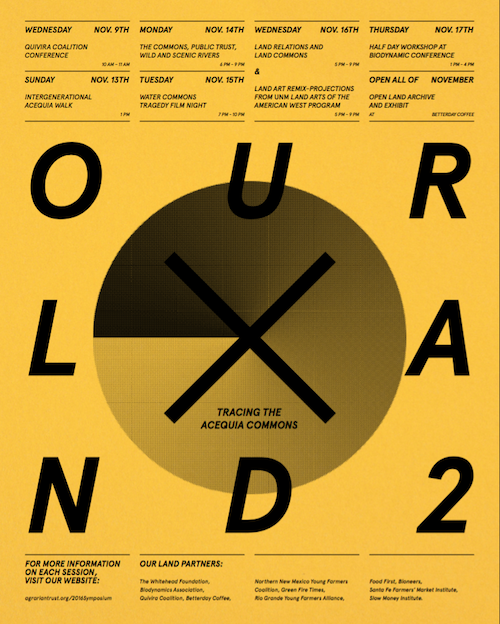 From November 9 through 17, in Albuquerque and Santa Fe, N.M., the Agrarian Trust will be hosting a symposium, “Our Land 2: Tracing the Acequia Commons.”. Presented in partnership with a host of food and economic justice organizations—Quivira Coalition, Biodynamic Association, Santa Fe Farmers Market, Slow Money Institute, Bioneers, Betterday Coffee, Rio Grande/ Northern New Mexico Young Farmers Alliance and the Whitehead Foundation—the symposium will focus on land-use and governance regimes of the southwest and desert regions. In the next 20 years, 400 Million acres of U.S. farmland are predicted to change hands. The consequences of this inflection in ownership are wide-ranging—its impact will be felt by all of us. Agrarian Trust has the mission to shift the destiny of farmland use in the United States, in terms of stewardship and access. We aim to push this system towards organic practices, community ownership models, and production for regional markets for more democratic and sovereign places and people. We present this symposium as a way to invite a broad audience into consideration of “the land question” and hope to provoke conversation and action. 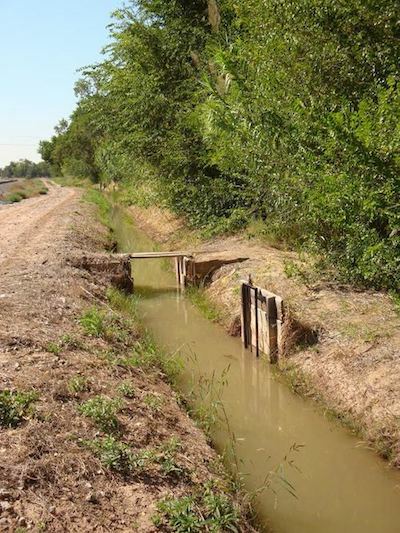 The Southwest’s acequia systems are some of the longest settled agricultural lands in North America. Here, the constraints of desert ecosystems confined traditional indigenous and later Hispano-Spanish agriculture to the bottomlands, fed by low-tech ditch irrigation. The acequia systems represent a powerful and direct commons-based governance regime and a curriculum from which many other regions can learn. In considering future prospects for sustainable agriculture and self determined regional economies—it seems useful for a national audience to learn from the bounded and mature farm systems of the Southwest, to look across regional contexts at issues of the commons, farmland conservation and evolving legal notions of public trust. Join us as we explore the overlapping and conflictual land-use patterns of the Southwest, and consider the prospects for our common resources and make plans for action. We welcome farmers of all ages, eaters, conservationists, planners, artists, anyone interested to relate, and to intervene in the destiny of the landscape that sustains us. Can our regions shift towards food sovereignty? Can our agrarian systems become more harmonious with their wild habitat? Can we be guided by our traditional commons? Let us learn together from national and regional speakers, filmmakers, artists, archivists and geographers. Ultimately, Agrarian Trust hopes that the history, management regimes and future prospects of acequia systems will serve as an inspiring model for other commons-based systems. The question is: Can these ditch commons be expanded to include their uplands and headwaters, or will ditch rights be lost to privatization and sold to developers?